The presence of Zimbabwe's President Robert Mugabe at a United Nations food summit in Rome is "obscene", British and Australian ministers have said. "This is the person who has presided over the starvation of his people," said Australia's foreign minister. 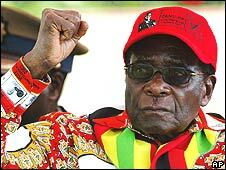 Mr Mugabe is staying in Rome for the summit, which begins on Tuesday. The president and his ministers are usually subject to a European Union travel ban - but he is able to attend UN forums. It is Mr Mugabe's first visit to Europe since the opposition Movement for Democratic Change (MDC) won a majority in parliamentary elections in March. He faces a presidential run-off on 27 June against MDC leader Morgan Tsvangirai. 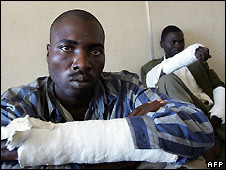 Mr Mugabe's supporters have been accused of attacking MDC activists, leaving at least 50 dead. The Food and Agriculture Organization (FAO) summit starts on Tuesday and reports say Mr Mugabe is expected to stay in Italy until Friday. The EU, US and UK are all strongly critical of Mr Mugabe's human rights record, as well as his management of the economy. "This is the person who has used food aid in a politically motivated way," said Australian Foreign Minister Stephen Smith, who is due to attend the summit. "So Robert Mugabe turning up to a conference dealing with food security or food issues is, in my view, frankly obscene," he said. UK International Development Secretary Douglas Alexander told the BBC he was "outraged" at Mr Mugabe's presence. "I'll neither shake hands with Robert Mugabe nor meet Robert Mugabe... This is not a man with any credibility or any contribution to a discussion on international food," he said. Zimbabwe used to be a net food exporter but now suffers from chronic food shortages. Inflation is running at an annual rate of 165,000% and just one in five adults has a regular job. Mr Mugabe routinely dismisses criticism of him as evidence of Western racism. He will be given the opportunity to address the summit. FAO spokesman Nick Parsons said the EU sanctions and the travel ban against Mr Mugabe do not apply because the UN is the forum for the meeting. "Just as (former Cuban) President (Fidel) Castro used to regularly travel to the United States to attend UN General Assembly" sessions, Mr Mugabe is free to attend this week's summit, he said. The Zimbabwean leader caused a stir at a similar summit in Rome in 2005 when he denounced the then UK Prime Minister Tony Blair and US President George W Bush as "unholy men". He also said the West was "foisting food" on the Zimbabwean people. In Zimbabwe, at least 70 people have been arrested following attacks on ruling party supporters, according to the state-owned Herald newspaper. The MDC blames the ruling Zanu-PF for the violence but this is denied by allies of Mr Mugabe.